The thousands of Muslims who devoted their Fourth of July weekend to attend the annual Islamic Society of North American (ISNA) convention got a rare chance to hear about the 7-century history of their faith in the US. "At least 10 percent of enslaved African Americans were Muslims," Ihsan Bagsby, an African American covert, told his enchanted ISNA audience. In a session themed Legacy of Islam in America: The Transatlantic Voyage and Beyond, he traced back the roots of African American Muslims in different eras. Bagsby said the first generation of Muslims were the enslaved African Americans who came from the Senegambia area and their descendants, highlighting many of their contributions. Senegambia refers to the African region that includes the Senegal River, the Cap-Vert region and the Gambia River. The region, colonized by both France and the British Empire as of the 1500s, were of special importance for both empires because West Africa allowed for a convenient way station for trade between Europe and their American colonies, and a warehouse for the African Slave Trade. Bagsby noted that by the 1920s came the second wave of Islam in the history African Americans, which he called "the rediscovery of Islam". "Among the many enslaved African American Muslims you have no traces of Islam after the Civil War and undoubtedly it is the result of the passing of generations, where we see the loss of Islam in the enslaved African Americans." The third stage of Islam in America, according to Bagsby, started with conversion amongst African Americans in the late 1960s. 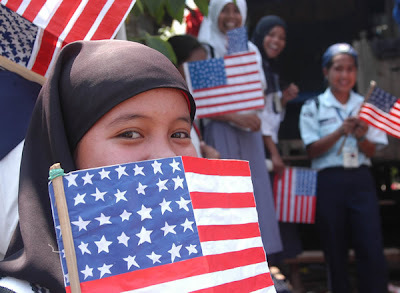 Though there are no official figures, the US is estimated to be home to nearly seven to eight million Muslims. Bagsby did talk about the history of African American Muslims, but what was more important is the predominant theme within that community that he brought to light. "The major theme that resonates throughout African American Muslim history is resistance," he said. "Islam among African Americans has always represented resistance to the endemic racism of this country. A resistance [and] rejection of White stereotypes of black people." Within African American communities throughout the history of America, Islam has been a beacon of light that allowed the people to resist the condescension they endured from those who considered them outcast. It helped the African Americans to reject the White molds of thinking, dressing and culture in order to be assimilated, which was a notion the black church supported. But Islam also played a vital role in the rejection of the isolation African Americans endured in the White world. "Islam, amongst African Americans, has represented a vehicle for the uplift of the African American people — morally, spiritually, economically, and politically —both as individuals and as communities." The first person to grasp the idea of Islam and resistance was Drew Ali Timothy, also known as Noble Drew Ali, who founded the Moorish Science Temple of America in Newark. "He tried to build in his own lifetime an activist community, not an arc community. He actually tried to build a community that influences the wider communities," said Bagsby. Aisha al-Adawiyya, a Muslim activist, said that a packed audience speaks a great deal about the growing awareness and interest in the subject. The young want to trace back their roots and "go beyond the media projection of Muslims in American and get some historical background." Bagsby's talk was an eye-opener for many of the audience. Zahra Hussein, a doctoral student who followed his talk through a deaf interpreter, was pleased to learn about the history and the role Islam played in African American communities for generations. "It was an interesting introduction into the beginning of American history that includes Muslim culture and religion," she said through an interpreter. The legacy of Islam in America is something Hussein would want to be known to the wider American society. "This is a topic that should be included in US history courses, because this is something the students are missing out on," she said. "There is such a strong Muslim foundation to the America culture, but no one really talk about it."